A medal that represents more than just a physical effort. It represents integrity, perseverance, and patience. It represents support, teamwork, and family. It represents life's ups and downs, and its many knowns, and many more unknowns. 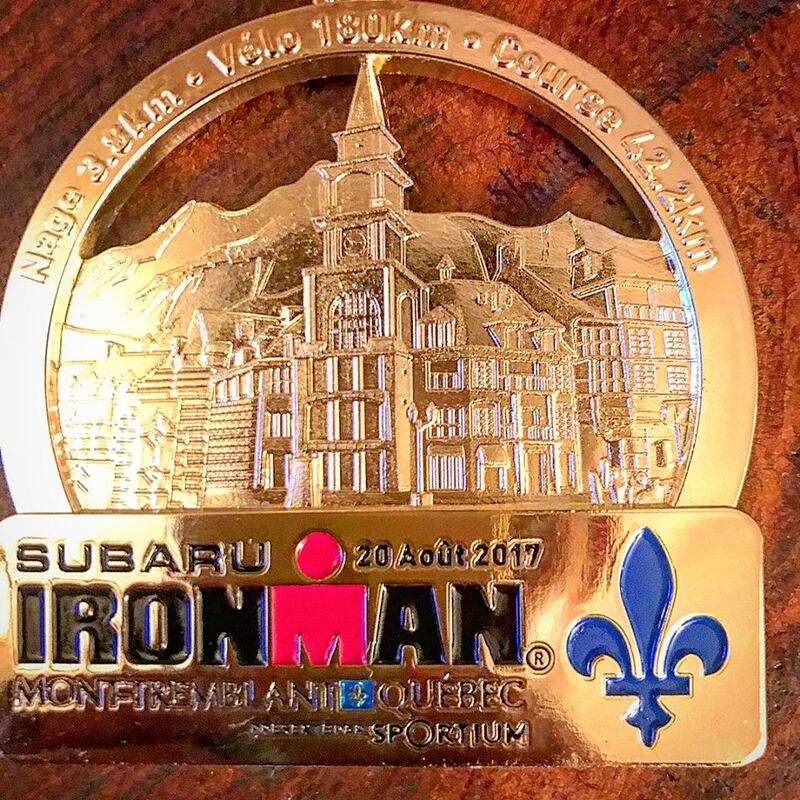 After completing my first Ironman, I yearned to put my thoughts out in writing. I feel I express myself the best this way. I enjoy blending an inspirational tone, with poetic devices, and flip back and forth between matter of fact and whimsical. Below are two creative excerpts I found refreshing to let out. They each resonate my Ironman mindset before, during, and now more than ever. Oddly but not-surprisingly, the voice of Bruce Lee kept arising in my head leading up to my big race, so I encourage you to read as if he was narrating. I think I really channeled his spirit to become an Ironman. Thanks Bruce! The last piece is a cumulation of personal reminders that developed over the course of my year-long training. They are bits of life wisdom I hope to one day share with my children. Enjoy! Swim 3.8km, Bike 180km, Run 42.2km. 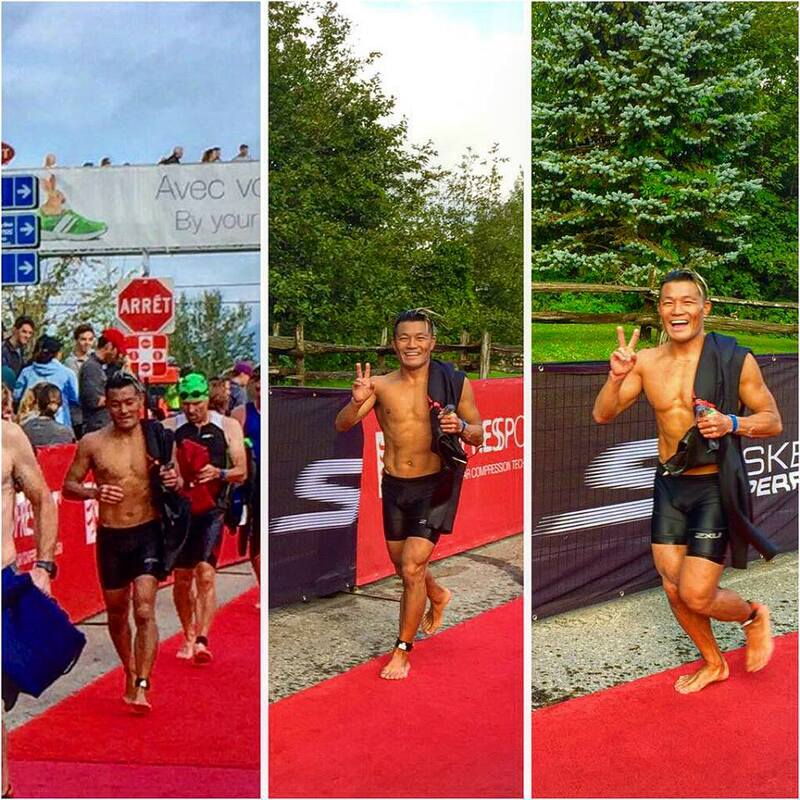 Completed my first Full Ironman in Mont Tremblant on Sunday, August 20th, in a time of 11 hours and 36 minutes. Ranked 407 out of 1937 racers. "When you resist, you resist yourself." When you are frozen in fear, pushed to the depths of the uncomfortable, and backed into a corner, you can’t help but fight fire with fire. It is human nature to fight back. It is normal to flee from danger. It is common to freeze. While overcast by the darkness, frozen by the cold, nearly defeated by the onslaught of resistance, life offers us an instant; a creak of light in the dark, a split second to make a choice. Instead of resisting what you think is inevitable, you take a pause. Somehow, the lights switch on, you snap awake, and in a flash, you relinquish control. One grasp, one step, one stroke, you come face to face with the resistance, you feel it, you see it; truly and beautifully. You take that micro-moment to accept what it has to offer; a realization ... that the resistance, the darkness, the fear, is you. It has been you all along. It has been the nightmares that disturb your dreams. It has been the distractions you day dream of. It has been the dreams you doubt and drive away. Dreadful narratives that dig you deeper into darkness. You breathe. You sight. You wait. You then remember. You are your own worst enemy. You put yourself in the corner. You told yourself those stories. You chose to fight fire with fire. Clarity cools like a breeze at your back. The calm of confidence begins to spread. You release with a sighing laugh. You harness this humbling reality, take what it has shown you, persevere with more patience, and a peace of mind. The resistance has now become your resilience. The bike was perhaps the most uncomfortable experience I've had in a long time. I talked the most to myself throughout the process. Things I would say to my classes like, "you got this man! ", "dig deeper, its there, trust your training", "breathe", "don't give up", "PUSH IT", "just get to the run", all the motivational accoutrements I had in my toolkit, I pulled out. I thankfully finished the 180km distance. And did it in a time of 6 hours and 8 minutes. That was the first I've ridden the 180k straight through too. Within the most powerful cyclones, there resides an almighty eye. A center point that anchors the storm. It stabilizes the chaos, and gives the storm it’s true power. Without this point of calm, the storm would have no focus and no foundation. Calm is a complex force, it is not stillness, it is control of movement. It is not quiet, it is the control of noise. It is not peace, it is the control of chaos. It is this universal quality that quantifies a person’s deeper strength. Under the harshest of conditions, the state of calm is truly a superpower. Once honed, the calm can make winning and losing, succeeding and failing, achieving and quitting, equally rewarding. Perspectives can change. Paradigms can shift. When you are calm, you see that finish lines are starting lines, and stopping points are stepping stones. When you are calm, the asymmetries and imperfections in life foster a fascination for deeper meaning. When you are calm, the mystical somehow manifests in the everyday mundane. When you are calm, your child-like curiosity is peaked at every turn. When you are calm, you become aware. When you are aware, you align. And when you align, you actualize. You will come to know this superpower when a storm evokes a calmness within. After my swim, I was elated to be alive, and in return, I felt the most alive I've ever been in my life. My fear of water as a child has turned into a 30 year challenge to conquer. That day marked the day I overcame my fear, and made it a part of me. The 3.8km swim took me 1 hour and 28 minutes. I still look back in disbelief. 1. Self care is health care. Don’t be lazy, take responsibility. You are a leader by example. Don’t take things for granted, take ownership. You have the resources. Don’t rely on others, take initiative. You must think long term. 2. Striving for better is better than striving for best. Being the best is overrated - it has as much unnecessary pressure as it does prestige. Best just like beauty is in the eye of the beholder. Your best will always be someone else’s good, but your better is just as good as someone else’s better. 3. Be great by being grateful and be grateful by being great. When you are humble with your successes, you hit the heart strings. When you balance the selfish with the selfless, you earn respect. Demonstrating gratitude is done best by doing great things. 4. Movement and meditation is different from Meditative Movement. Separately, exercise and innercise are good, but together, they are great. It takes repetition and rhythm to get into flow. Meditative movement happens with unconscious competency and physical autonomy. 5. Rather the pain of discipline than the pain of regret. Thank you to my parents for capturing this moment I will remember for the rest of my life. They were the crew that helped me get to the start line, and to many more finish lines. Newer PostWhat do I know about love?